Some years ago I finally took the plunge and tasted a fish taco. The thought of a piece of fish in a taco weirded me out, but have never been a big fan of a piece of fish, unless battered & fried. Well, I fell in love, and now it's the only thing I order from a Mexican taco shop. This is one food I could never get bored with! I did some searching for a recipe and found this one from Lori of Recipe Girl, which is also the same as the one here. I've only made these twice in the years, only because my family won't eat fish. My oldest ending liking these so yay, 1 for my team! Anyways, I used frozen, thawed tilapia for mine, cutting each filet in half lengthwise. I served this up with some mexican rice and refried cheesy beans. I kept them warm in the oven as I fried each batch. Note: this recipe does need 2/3 hours marinating time! 1. Prepare Baja Sauce: Combine all ingredients; stir well. Refrigerate until ready for use. 2. Place fish in a heavy-duty large plastic ziploc bag. Combine bottle of beer and Mexican seasoning in a bowl. Pour into ziploc with fish; seal and chill 2-3 hours. 3. Pour oil to depth of 1½” in a deep skillet or Dutch oven. Heat oil to 360° F.
4. In a medium bowl, combine flour, salt, sugar and baking powder. Whisk in 1 cup beer and hot sauce. Drain fish, discarding marinade. Coat fish in batter. 5. Cook fish in batches about 4 minutes, or until done. Drain on paper towels. 6. Place 2-3 pieces of fish on each tortilla. Squeeze lime wedges over fish; top with remaining ingredients. Drizzle with baja sauce and serve immediately. How did you read my mind? 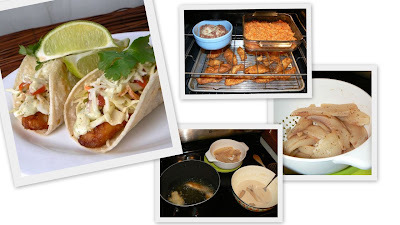 I have been searching and searching for a perfect fish taco recipe. I've never made them at home but honestly, that first picture of yours sold me. They look fantastic! Rachael, these look wonderful and will be perfect for a Lenten Friday meal. Thanks so much. I hope you are having a day as lovely as your blog. I'll be back often to visit. I love these. Well, I pretty much love all fish tacos lol! My Mother (not from SD) used to be grossed out at the thought of trying them. I finally got her to taste them & she loves them of course! These look AMAZING, but I'm allergic to beer (hopps specifically) what substitute can I use to keep the batter light? I was thinking you could probably use 12 oz sparkling apple cider instead of beer? I think the sweetness of the apple cider would be nice with this too. Making this tonight! Thanks again for the recommendation. Oh my gosh... these are amazing! Thank you for the recipe. These look great! Going to try it using frozen breaded fish fillets. In place of beer, when I make "beer bread" or "beer batter" I always use either sparkling water or a clear soda (7-up or Sprite) the carbonation is much needed to keep the batter light! Just made them last Night to my Family! A totally blast of Mexican flavors! Soooo delicious!!! Txs Rachelle! Dough was too gummy. Will try with baking soda instead.